The Perfect Start to a New Year! It’s the start of a New Year, the time when people make New Year’s Resolutions that hardly anyone actually keeps. This year, instead of making yet another set of resolutions that will fade away by February, discover the purpose in your life. “What’s the meaning of life?” That’s supposed to be the ultimate question, right? You can find answers in religion, education or philosophy but all those answers are someone else’s purpose for you. What’s your purpose for your life? Join us and discover the hidden purpose in your life! The night will begin with Ramdas leading the group through a simple exercise to identify your life’s purpose. We’ll then experience a Yoga Nidra session (no experience required). Ramdas is the Senior Teacher at Bhakti House and has dedicated his life to the practice and teaching of yoga. 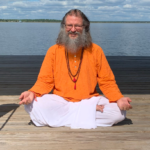 He’s taught yoga for 17 years and has been recognized as a Senior Teacher of the I AM Yoga Lineage by Yogi Amrit Desai. The journey of yoga that Ramdas has followed led him out of dark depression. He now focuses on making the ancient secrets of yoga available for practical use in our everyday lives. Ramdas is the author of LIVE FREE! (available January 2019) and the online courses at LiveHappy.us. We will send you a link to complete your registration once your membership is verified. No Membership? Register by phone or text using the directions above. Please indicate that you do not have a current membership. You can also self-register online using either PayPal or Venmo by following the directions below. 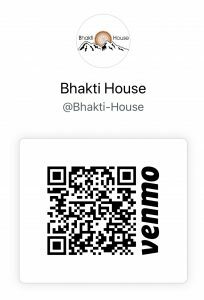 Be sure to include exactly what your Venmo payment is for: January 2019 Living with Intention Workshop.